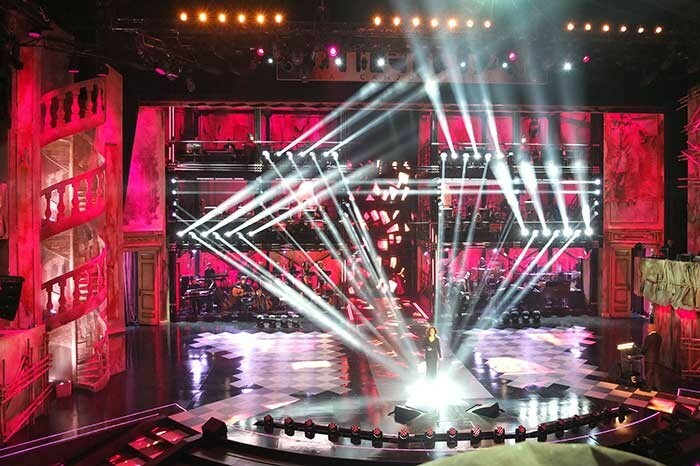 Italy - Over 200 Robe moving lights graced the lighting rig for the 64th edition of the world famous Sanremo Music Festival in Italy, staged at the Teatro Ariston in the picturesque Ligurian city. The show was broadcast nightly on national TV channel RAI1’s primetime. The lights were specified by the show’s director of photography Marco Lucarelli. The full equipment count included 52 Pointes, 66 LEDBeam 100s, 80 LEDWash 600s, 18 LEDWash 1200s and 18 LEDWash 300s – all from Robe’s ROBIN range. 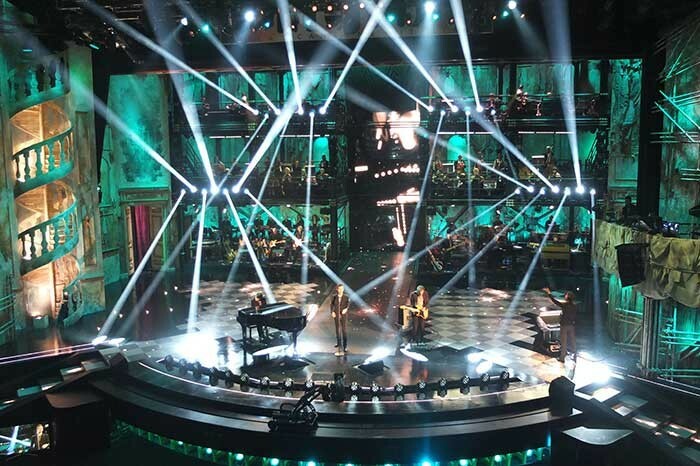 The show once again captivated live and television audiences over four nights of performance. This year’s event earned much acclaim, both for the quality of the artists and special guests, as well as for the stunning production and the great harmony between lighting and scenography. The Pointes – rigged upstage on vertical and horizontal sections of the stage set - literally flooded the whole venue with their powerful beams and bright colours and were really able to transform the whole look and feel of the space. One minute they would be bathing the stage in a soft wash, and the next the beams were boldly slicing through other lighting or creating stunning projections, texturing and effects on the stage or eye-catching aerial effects with the prisms. The Pointes also provided a strong and dynamic backdrop for the artists. The LEDBeam 100s framed the stage beautifully, positioned on the floor in a semicircle. Arranged like this, they effectively became a part of the stage scenery and were also great for creating fast and colourful audience-facing effects on camera. Their small size and light weight made them near-invisible, so positioning them right in the foreground on the stage was a great choice that did not interrupt any sightlines. With all the LEDWashes on stage, the whole theatre - including the audience – was lit in a ‘signature’ ambience for the Festival. All the lights were supplied by Mixer, one of Italy’s leading equipment rental operations and a big investor in Robe. Mixer’s CEO Walter Taietti says: "Our company was the first to use Robe products in Italy for all types of events including the broadcast world. We have always believed in Robe’s reliability, and the products continue to be specified for the top shows for the great quality they bring to any production. For us, the excellent relationship between Robe and the support and technical assistance from (Italian) distributors Robe Multimedia is also most impressive." The 2014 Sanremo Music Festival was won by Arisa with her song ‘Controvento’ who will now go on to represent Italy in the Eurovision Song Contest in Denmark in May.